Underwriting is a non-commercial announcement of support about your business or organization! You can underwrite KCSU by sponsoring specific programming, or through pre-recorded announcements. KCSU is one of the largest college radio stations in the country. We reach more than 250,000 people in the Fort Collins, Greeley, and Loveland, Colorado area. Plus, we’re available worldwide on kcsufm.com, our RadioFX app, and TuneIn. Your underwriting spots help support students learning broadcast techniques, as well as our rotation of DJs throughout the semesters. To purchase or ask questions about underwriting and services, email underwriting@kcsufm.com or call 970-491-2026. A consistently aired pre-recorded message up to 30-seconds that may include music. A KCSU DJ of your choice will mention the name and brief description of your organization 8 times during their 2-hour live show. Prices vary per day! Give us a call! Each weekday during drive time at 5, 7, and 9 p.m., KCSU plays our Concert Calendar, a 1-minute announcements about entertainment happening in Fort Collins that night. We will announce your sponsorship at the beginning of the calendar and read a brief description of your services at the end. As an added value, this calendar is printed Monday through Wednesday in The Rocky Mountain Collegian. Plus, we’ll add your sponsorship to our web concert calendar! Every odd hours from 9 a.m. to 9 p.m. KCSU airs an up to date newscast about happenings in our Northern Colorado listening area. We will announce your support at the beginning of the newscast and read a brief description of your services at the end. That’s 7 total mentions. Support the exclusive radio broadcast of the CSU Women’s Volleyball home games (fall semester) and Men’s Baseball home games (spring semester). KCSU mentions your business throughout the game. The mentions average 4 per hour for up to 5 sponsors with roughly 20 games in a season. Games are about 2 to 4 hours in duration. Pick your favorite KCSU podcast and sponsor their next season! KCSU podcasters produce a minimum of 5-episodes per season, which typically start at the beginning of each new semester. This special package gives your organization exposure in the podcast, on KCSU airwaves, and our social media. Sponsor 2 podcasts for $1000! Not working for you? Just email us at underwriting@kcsufm.com and we’ll design a podcast package for you within your budget. Bulk buys can be applied to any total buy on an underwriting. KCSU services are not offered at a discount. All underwriting costs include basic production. Air Times: We will try to honor requests for specific airing times, but reserve the right to select air time due to technical or schedule limitations. Underwriting Spot Content: May include business names, slogans, brands, trade names, and service listings. Cannot include price info, calls to action, or any other language stating or implying favorable comparisons to other businesses. Show Sponsorships: Shows typically follow music, public affairs, news, or sport themes. We recommend contacting us to help pair your organization with the right show. Public Service Announcement: See our Services page for PSA information. Mentions: A 10-second or less announcement of an organization’s services or purpose. For the full Rocky Mountain Student Media Rate card click here or download the pdf here. 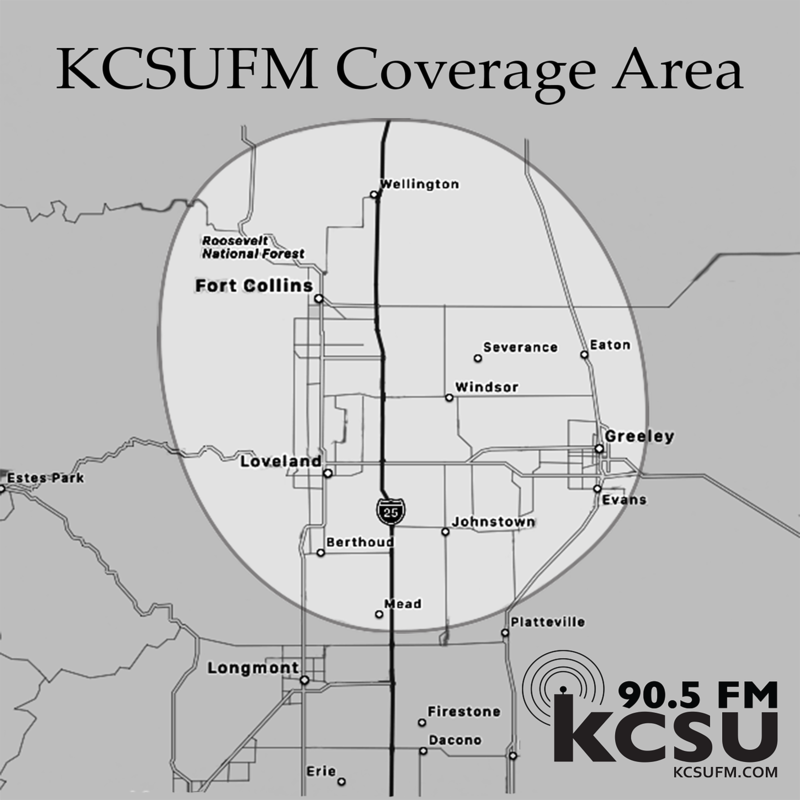 Coverage Map of where KCSUFM broadcast reaches. KCSU’s underwriting and service agreements do not discriminate on the basis of race, color, religion (creed), gender, gender expression, age, national origin (ancestry), disability, marital status, sexual orientation, or military status, in any of its activities or agreements. We reserve the right to deny underwriting and services to persons or organizations who do not align with the mission of KCSU.